Yes indeed, the ‘Big Pole in our goal’ – Łukasz Fabiański – celebrates his 30th birthday today. So I’m sure everyone will join us here at SCFC2 in wishing Łukasz a very Happy Birthday – and a clean sheet this afternoon of course! Łukasz joined the Swans from Arsenal when his contract expired in July 2014 and made his competitive debut for the club on 16 August in the 2–1 win against Manchester United at Old Trafford – in the Swans opening game of the 2014/15 Premier League season. 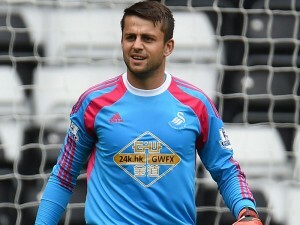 The popular Polish international keeper who started his career with Lech Poznań, has been ever present between the sticks for the Swans this season and his impressive performances – not to mention 11 Premier League clean sheets thus far – must make him one of the firm favourites to lift the Swans Player of the Season award in May. In fact, such has been his form in his 32 appearances for the Swans (to date) that newspaper reports have even suggested that Italian Serie A giants Roma are interested in his services. Whatever “rumours” the press wish to speculate on, one thing is for sure and that is that the Big Pole has already endeared himself to the Jack Army.